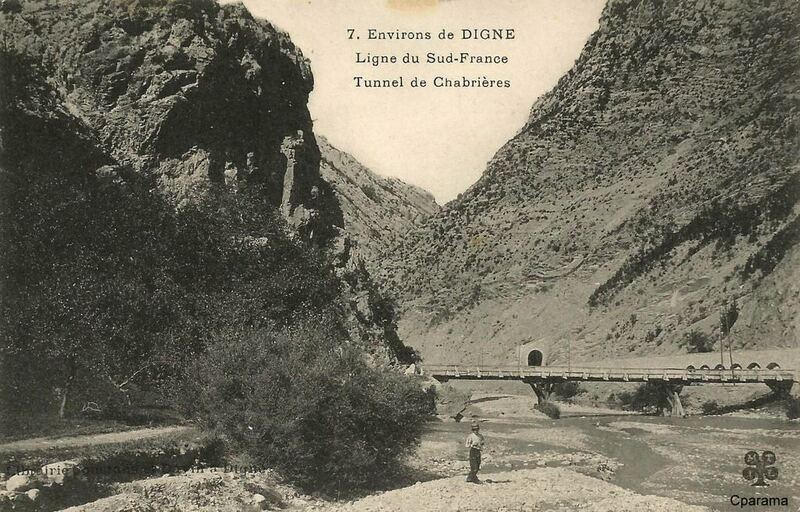 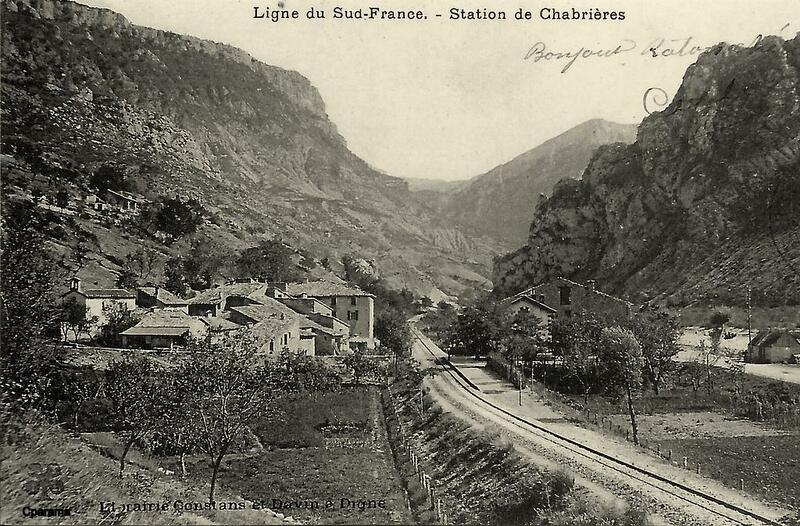 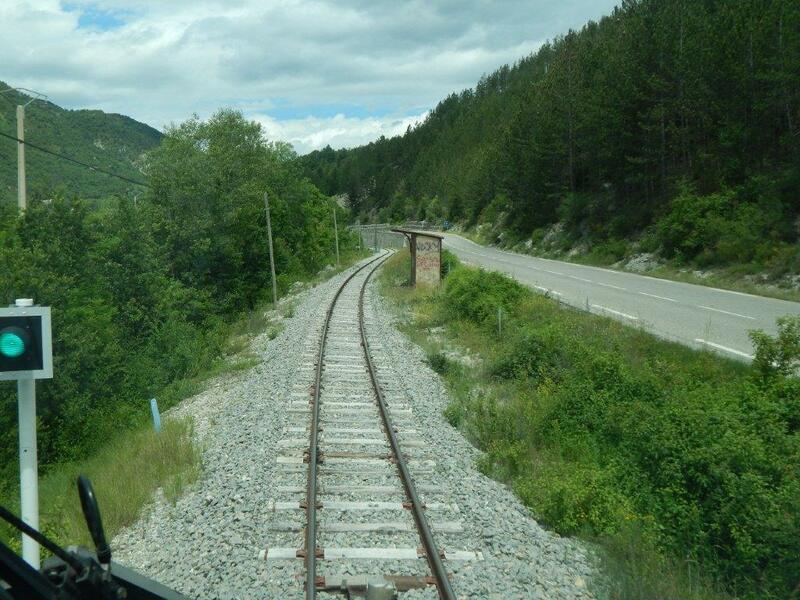 Road rail and river continue in close proximity down the valley from Chaudon-Norente, until the railway passes under the road and into a tunnel. 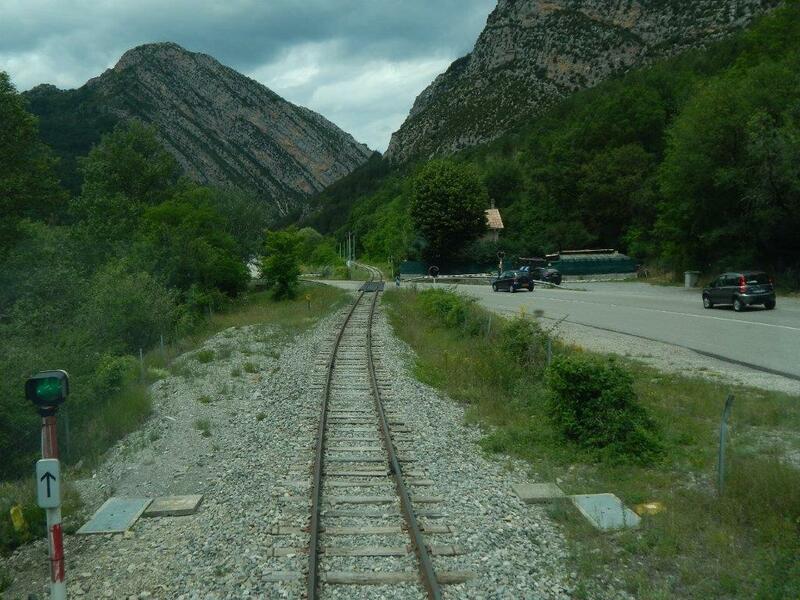 Looking back up the valley of l’Asse (above) from over the portal of the tunnel. 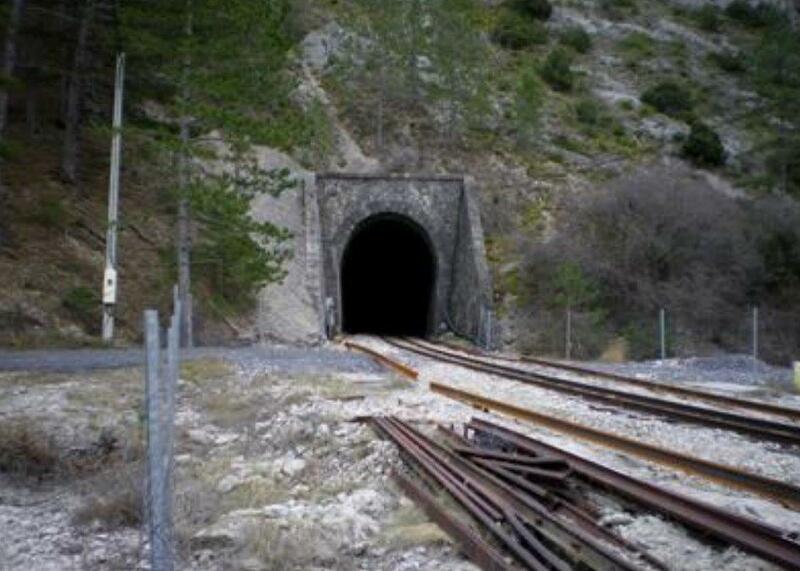 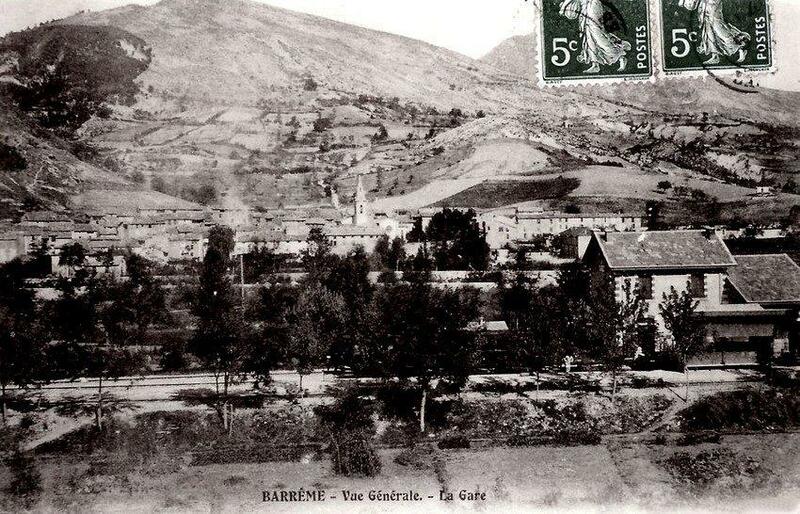 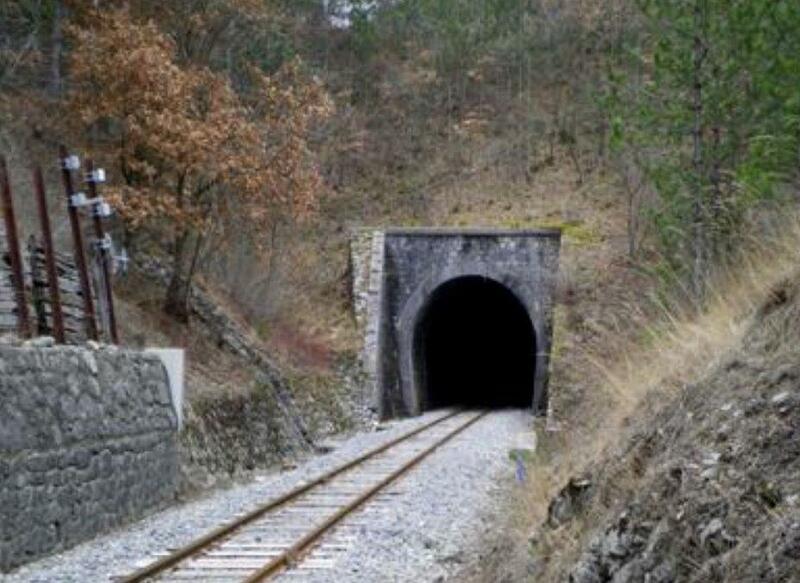 The Tunnel de Serre Geneston is at an altitude of 655 metres above sea-level and is 213 metres long. 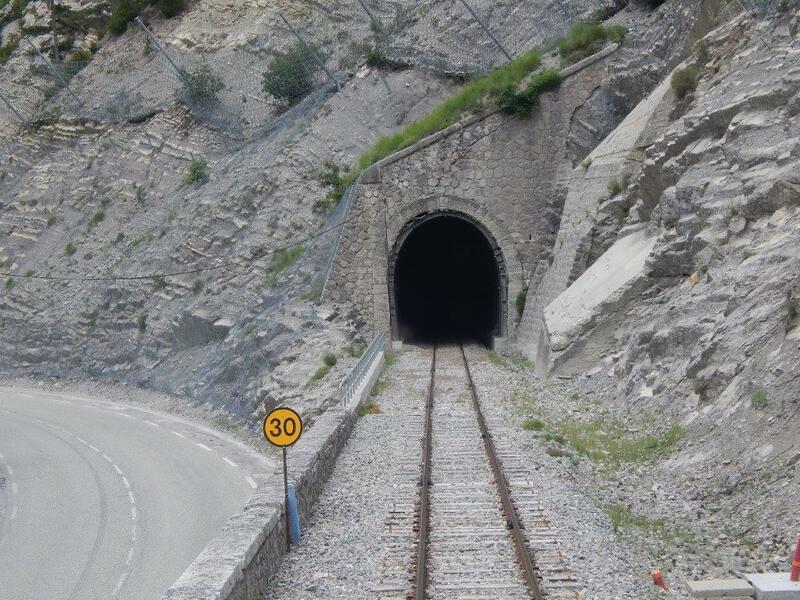 The N85 has been realigned over the southern portal of the tunnel to remove a sharp bend in its alignment. 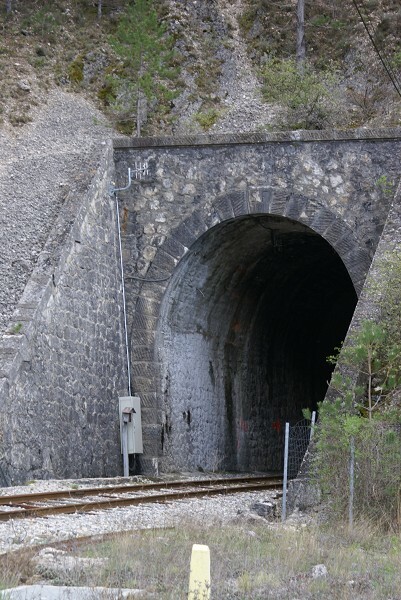 This means that the original portal is shrouded by a concrete span. 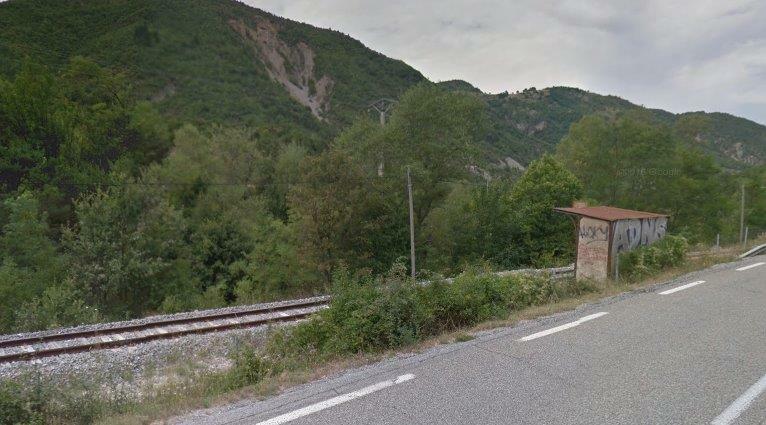 After the Tunnel de Serre Geneston the railway , road and river are once again close together, this time, however, the railway is considerably higher than both road and river and its formation is supported by a lengthy retaining wall. 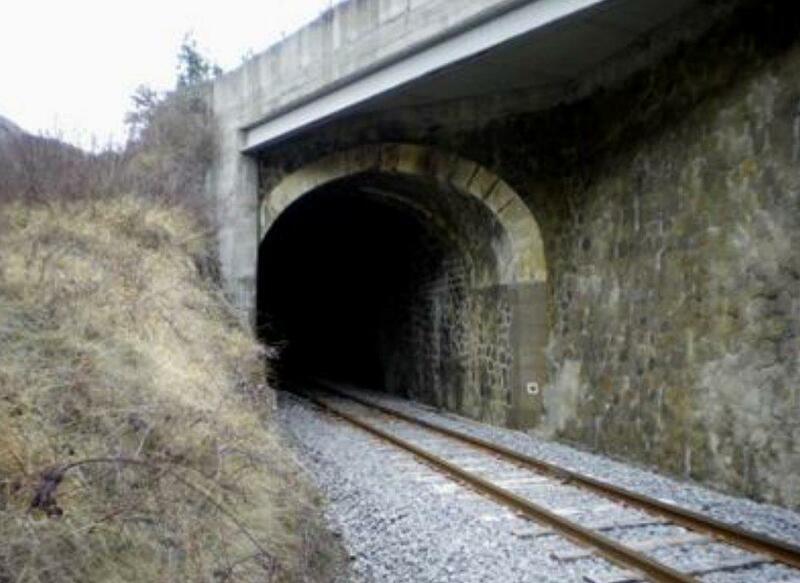 Arched masonry culverts permit drainage. 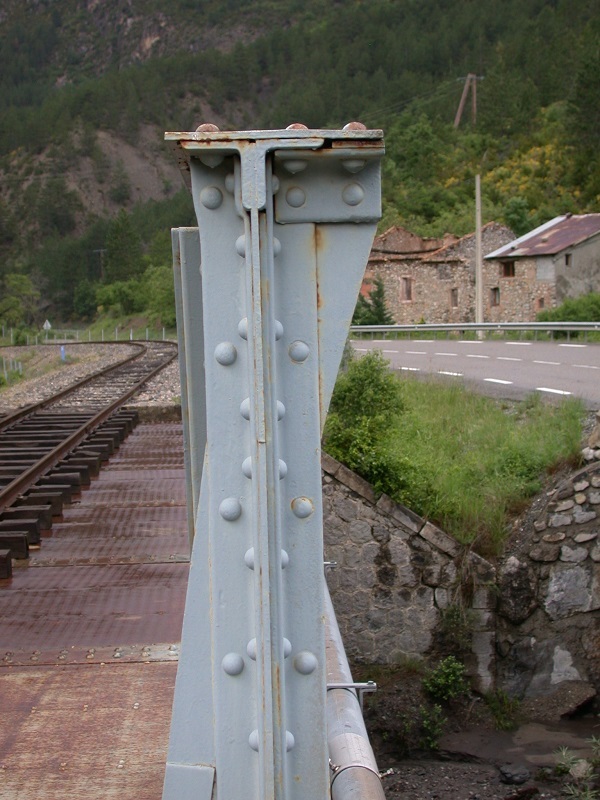 After quite a length of masonry retaining wall, the next significant structure on the railway is the bridge which carries it over the N85 at …………………………… The images below show the view of the structure from the south and then from the north. 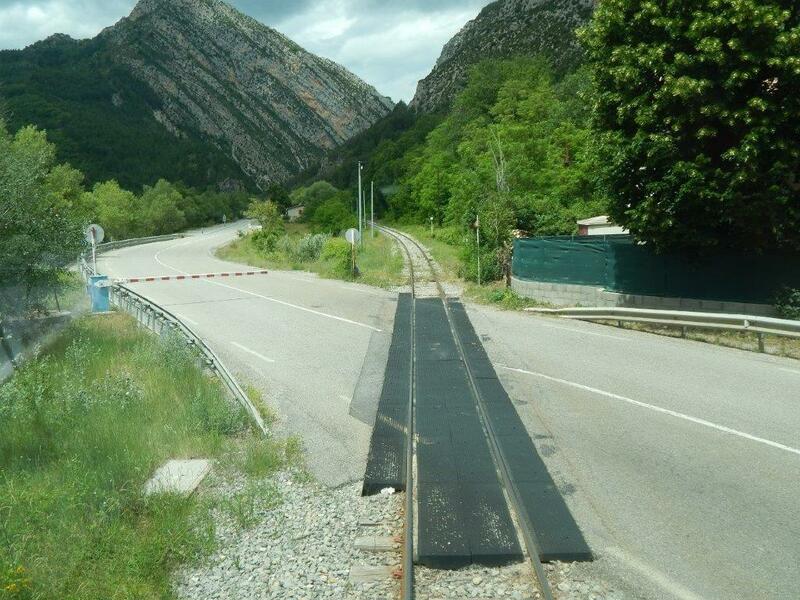 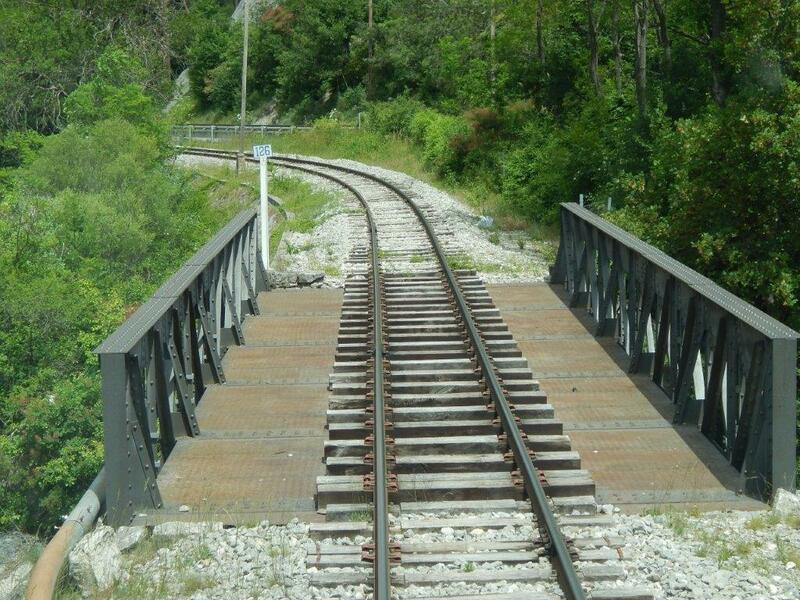 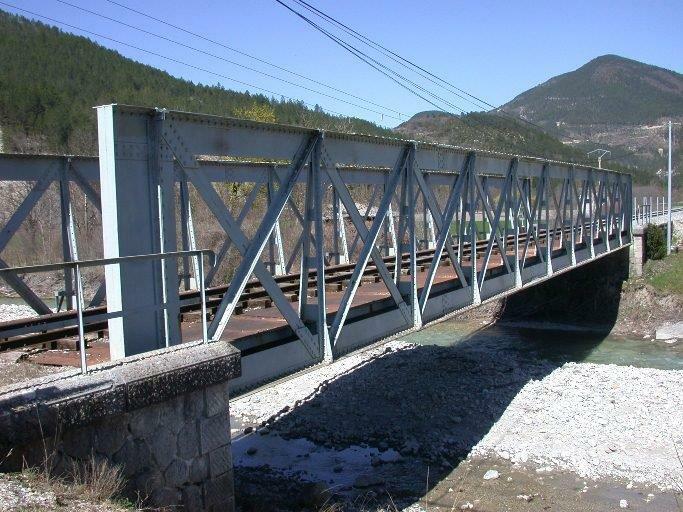 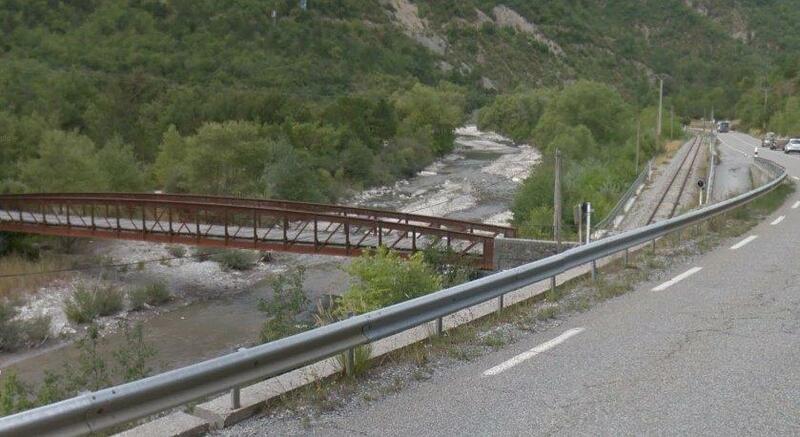 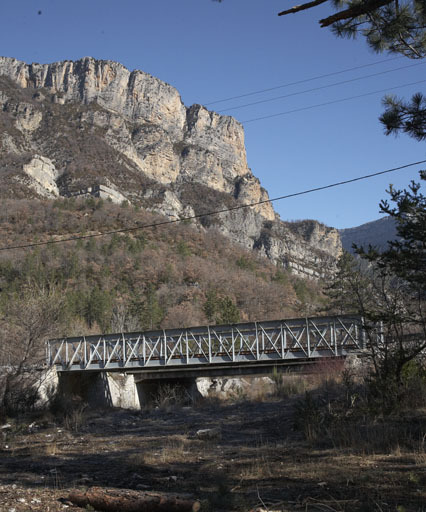 It probably constitutes the least attractive bridge on the Nice to Digne Railway line! 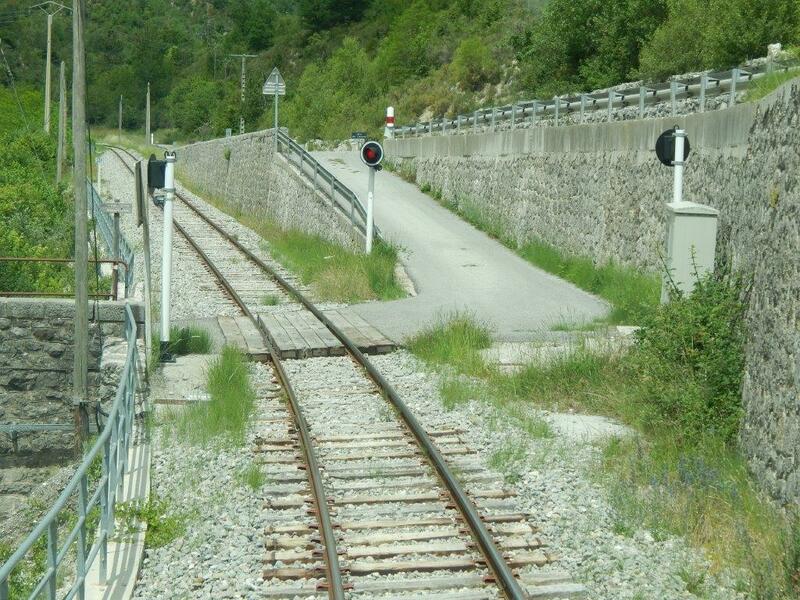 In a short distance the railway drops to be at a similar level to the river and while running in very close proximity once again, this time is is the road held up above the railway on a significant retaining wall. 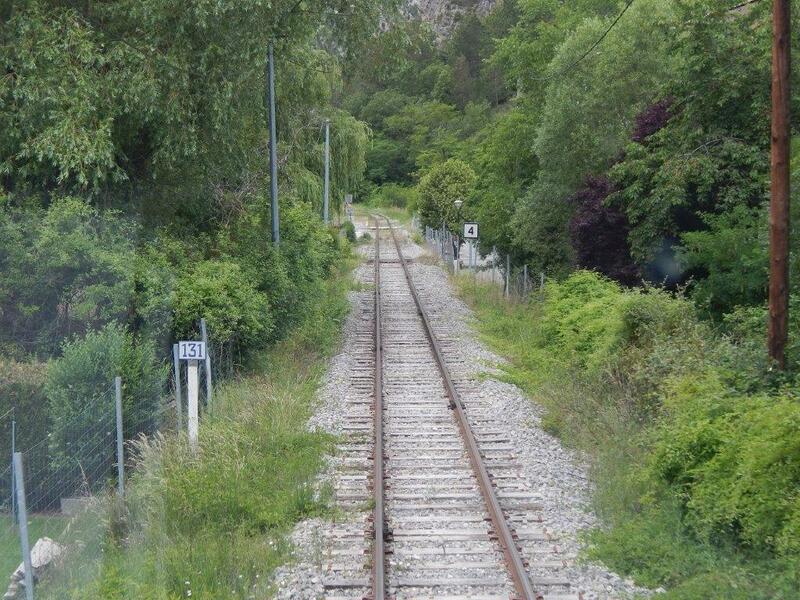 To the West of Chabieres, the line turns northwards and then enters the Tunnel de la Clue-de-Chabrières. 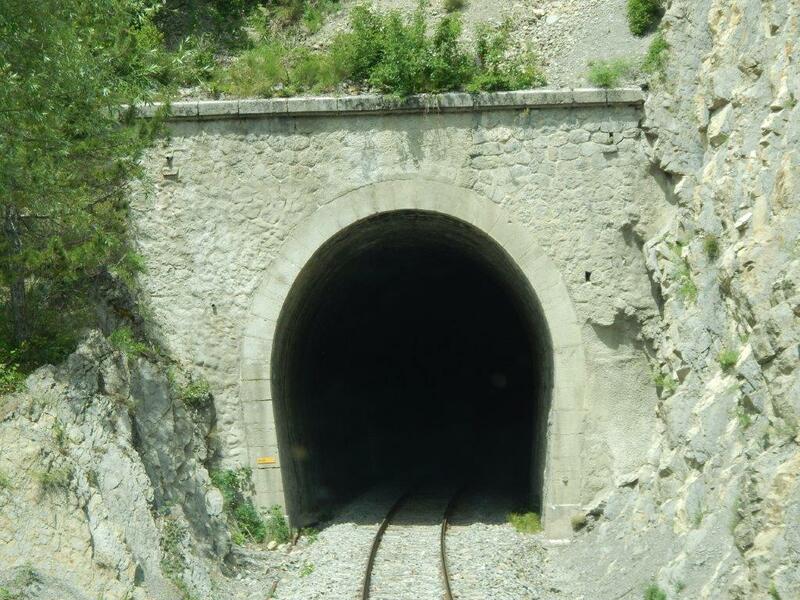 We are now about 600 metres above sea-level and the tunnel is nearly 600 metres long! 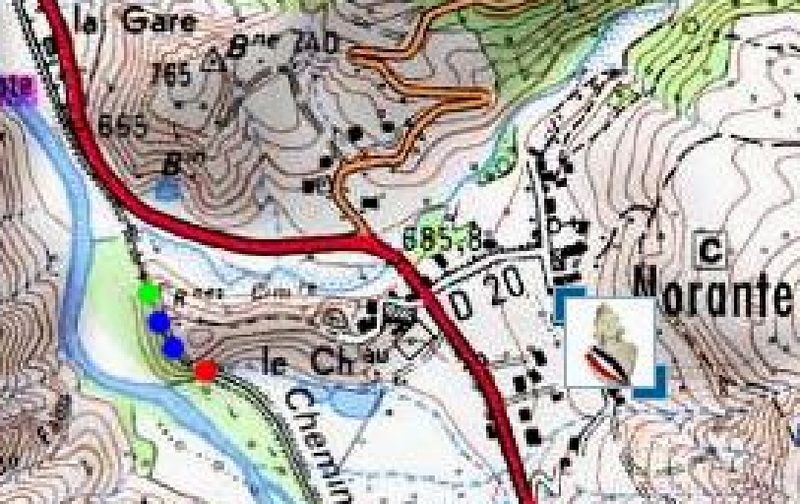 It is marked by the usual red, blue and green dots on the map below. 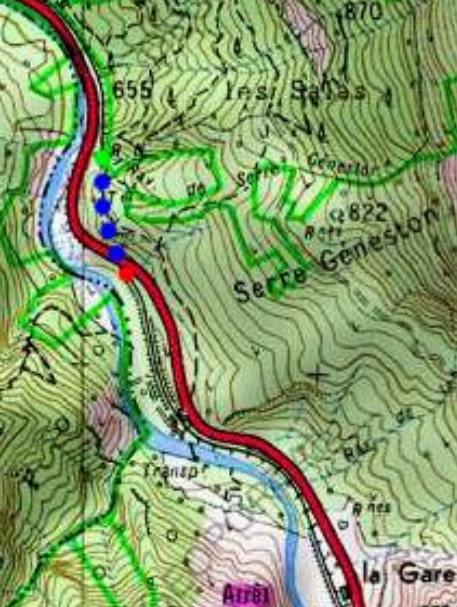 The South Portal from some distance upstream on the other bank of the river. 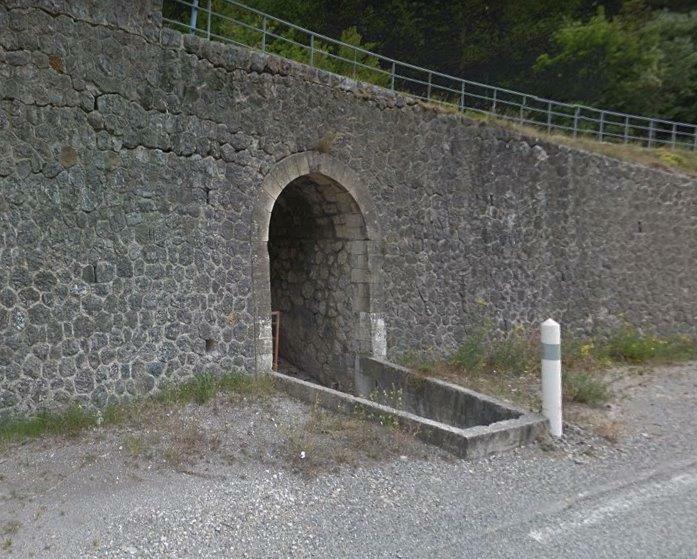 The South Portal of the tunnel. 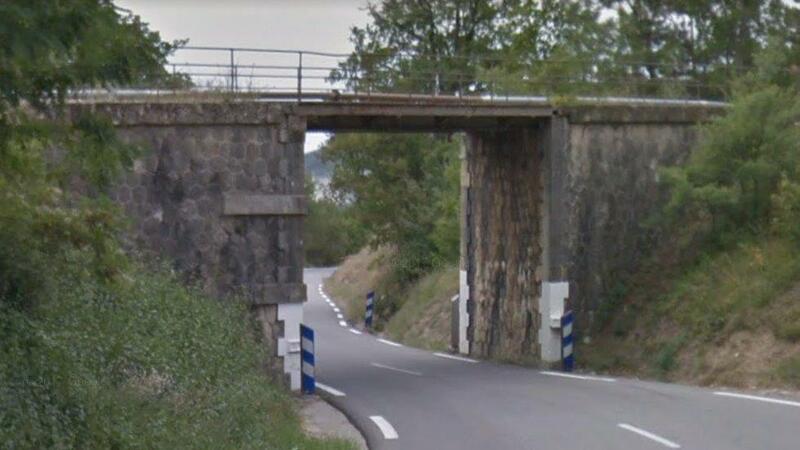 The North Portal of the Tunnel is shown in the two images above  and below, (c) Nicolas Janberg. 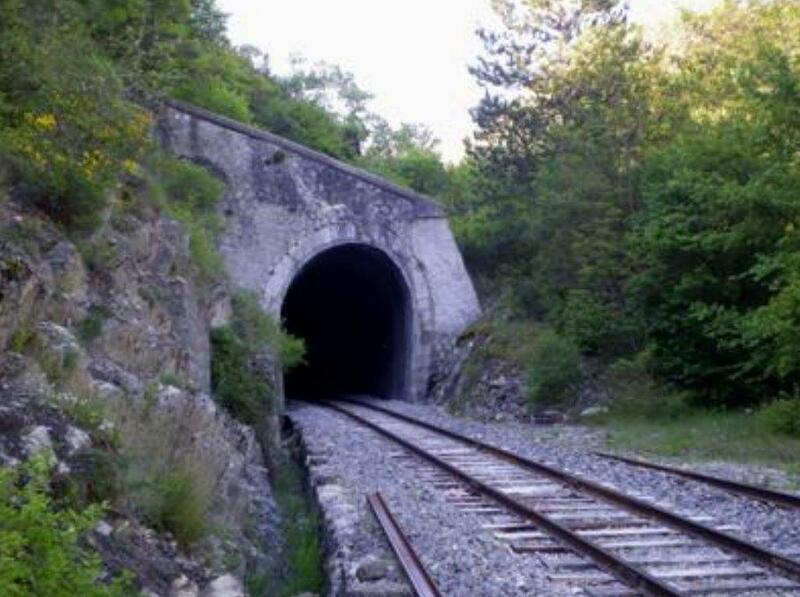 A short distance after the train passed through the tunnel it went through another request halt – l’Arret de de Saint-Michel-de-Cousson. 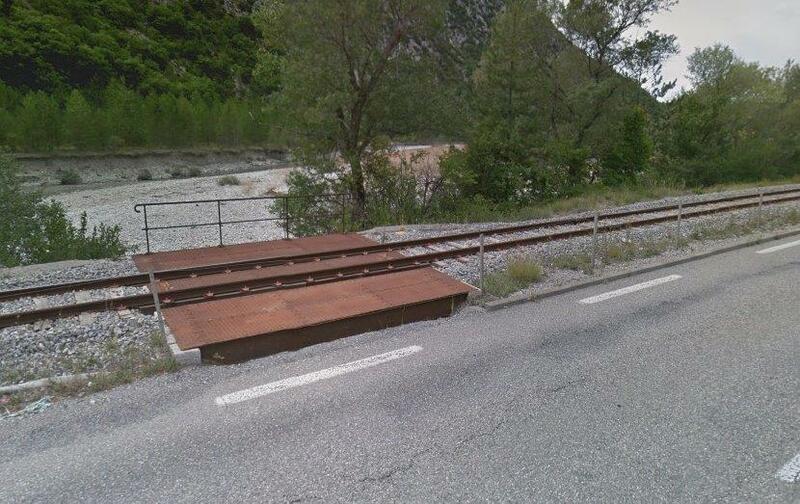 I have not been able to find pictures of this halt. 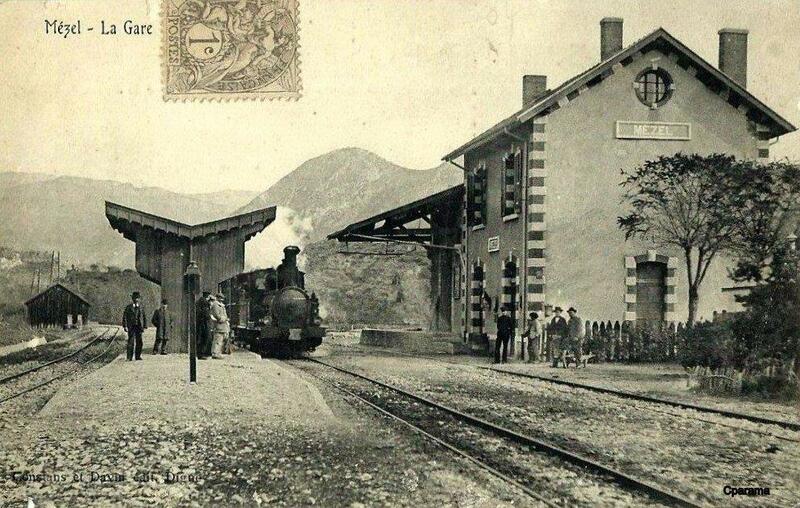 It then, once again crossed the main road at a level-crossing. 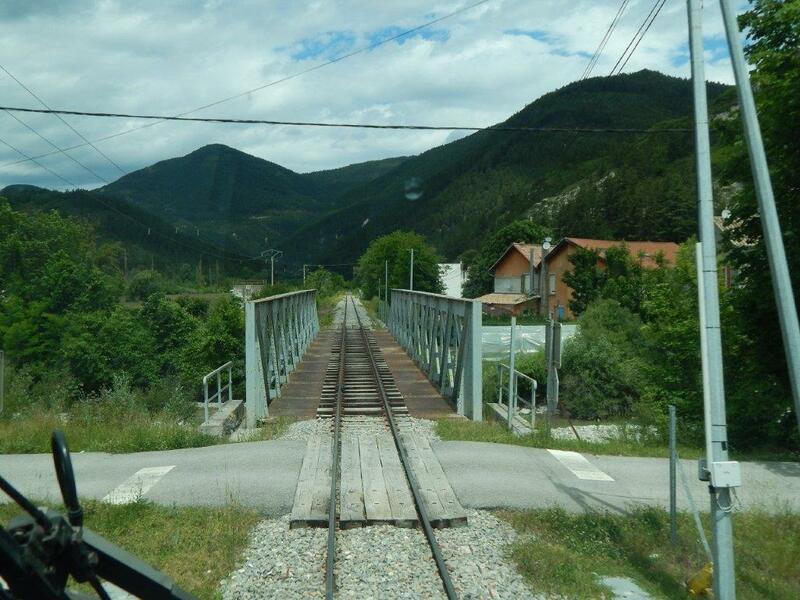 Road, rail and river all once again in close proximity and a typical small span bridge carrying the railway over a minor tributary of l’Asse. 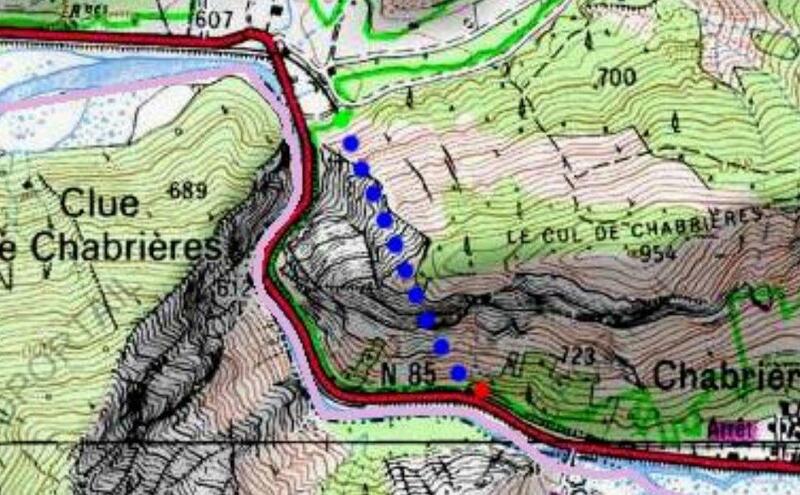 The line continues alongside the road for about a kilometre before swinging away to the south following the north bank of the l’Asse. 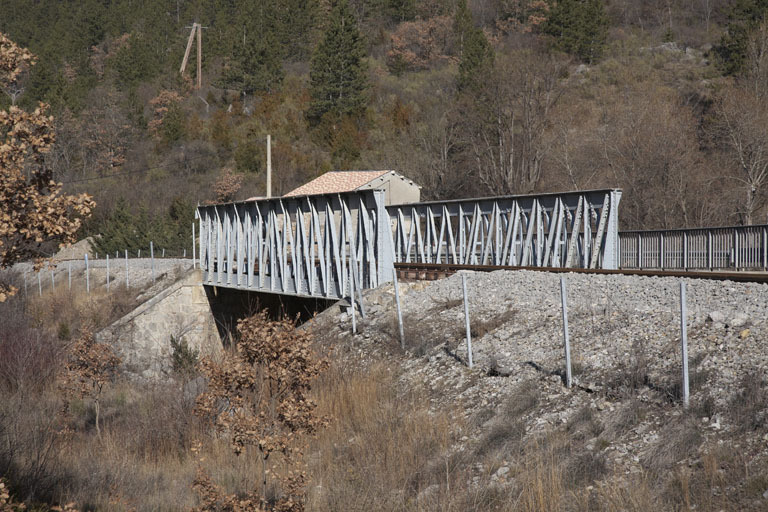 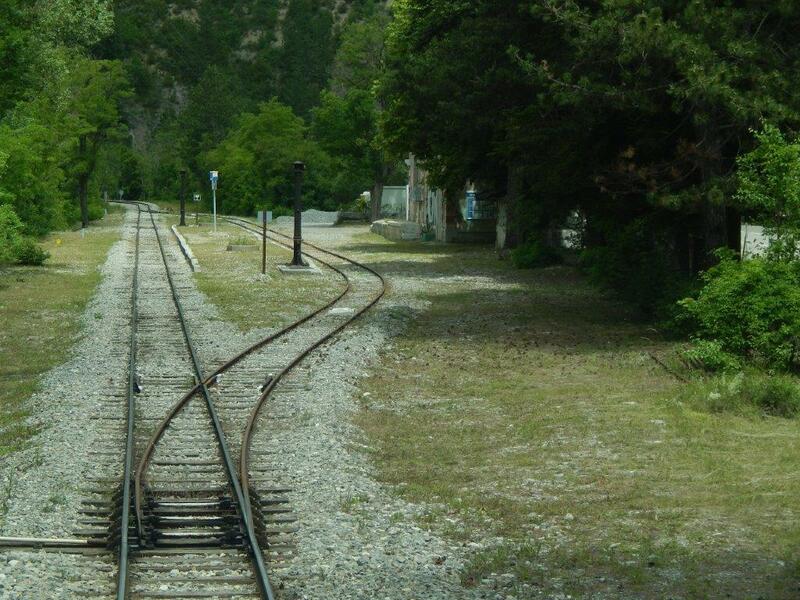 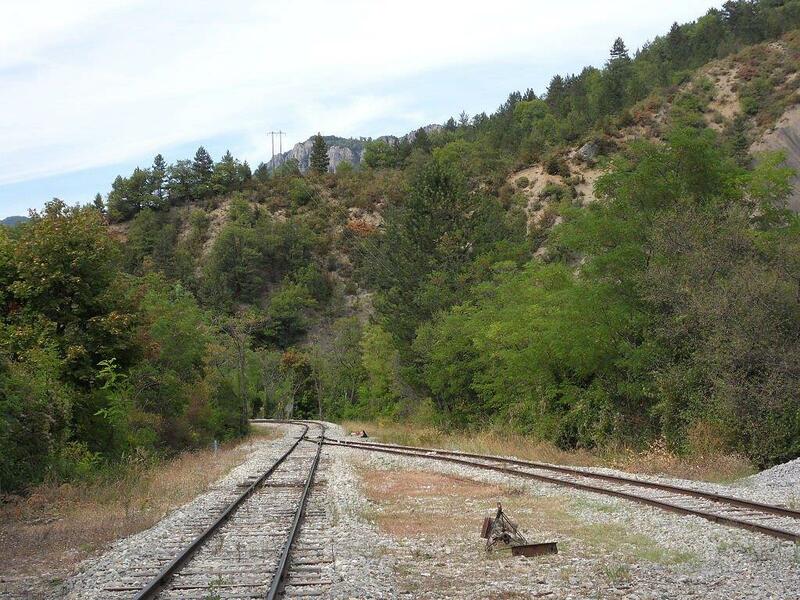 A further kilometer West and the road rail and river are once again close for a short distance as the valley narrows. 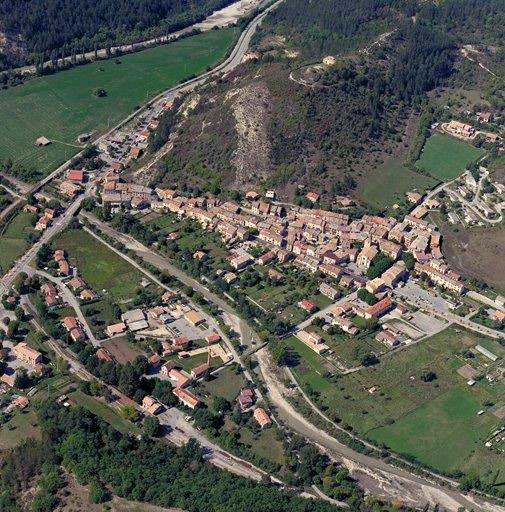 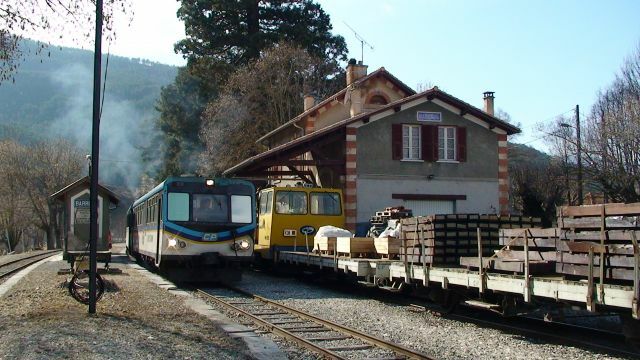 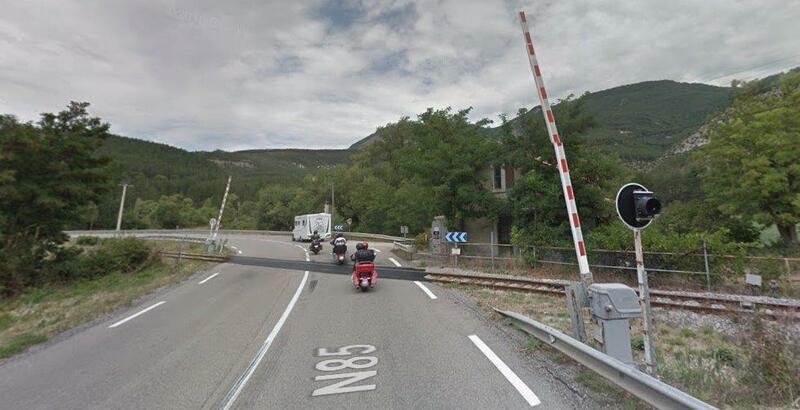 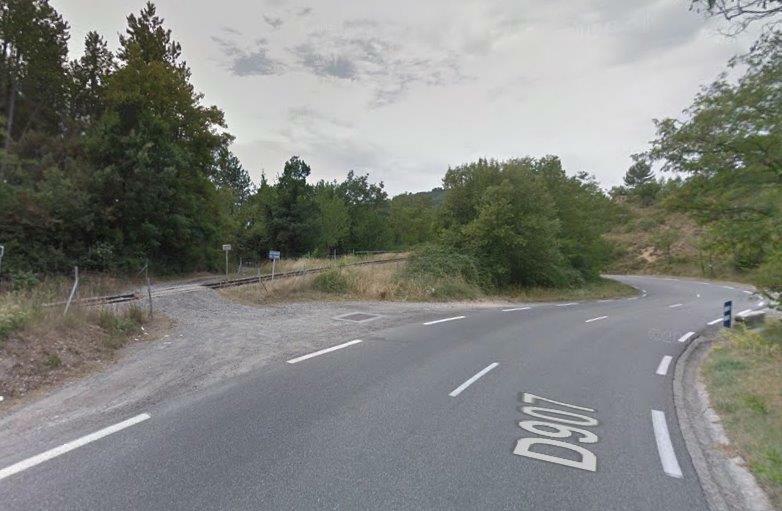 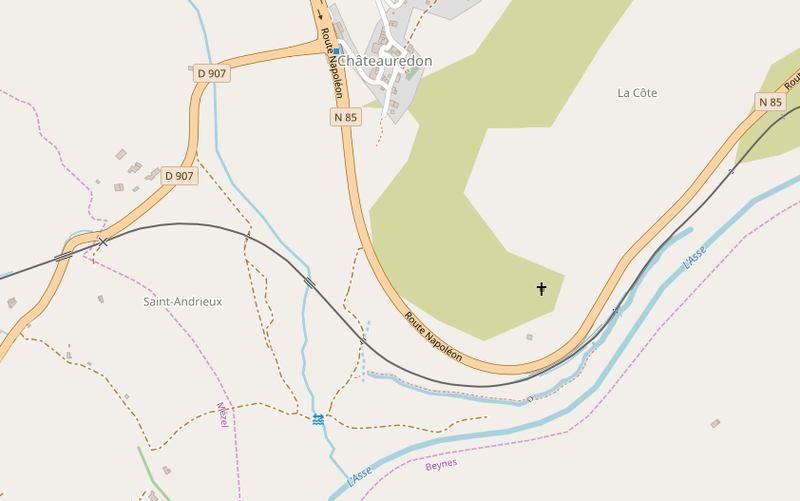 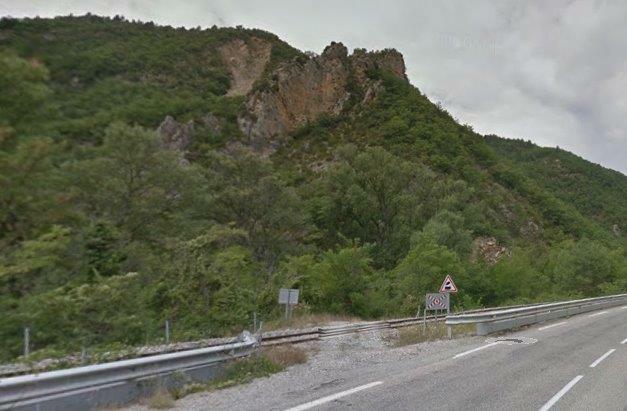 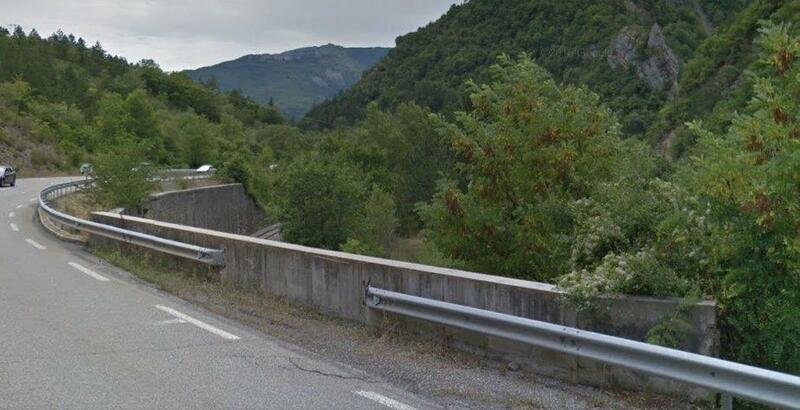 The N85 road then turns away north into the village of Chateauredon, and the river turns away south leaving the railway on its own to cross the valley of the Saint-Jean a tributary of l’Asse! 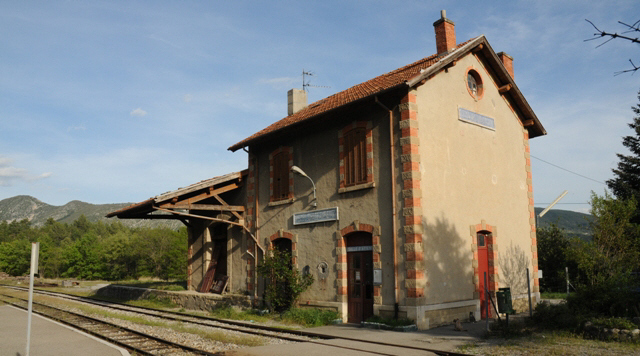 It is here at this station – Mézel/Châteauredon – that we take our next break. 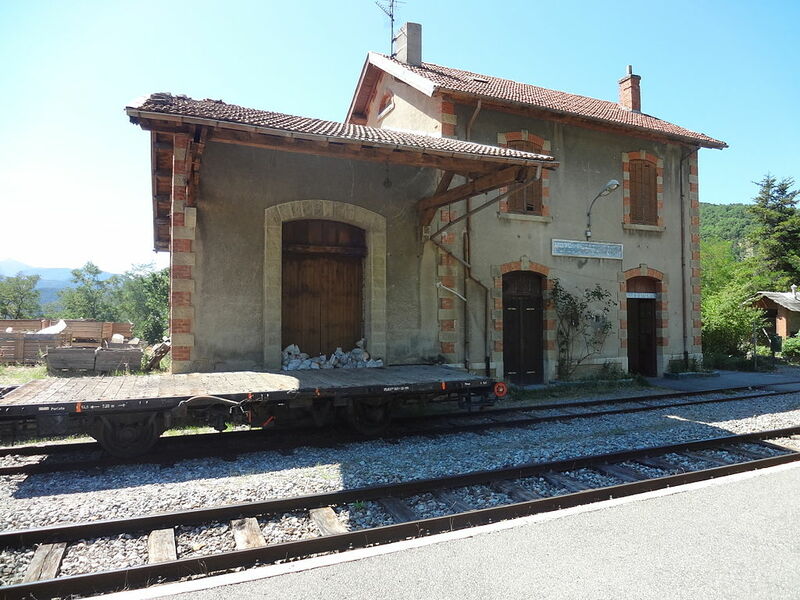 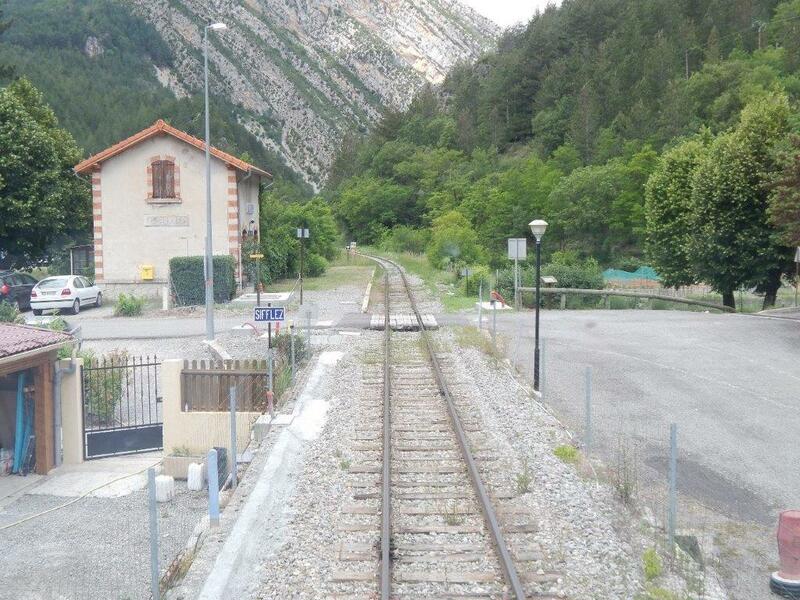 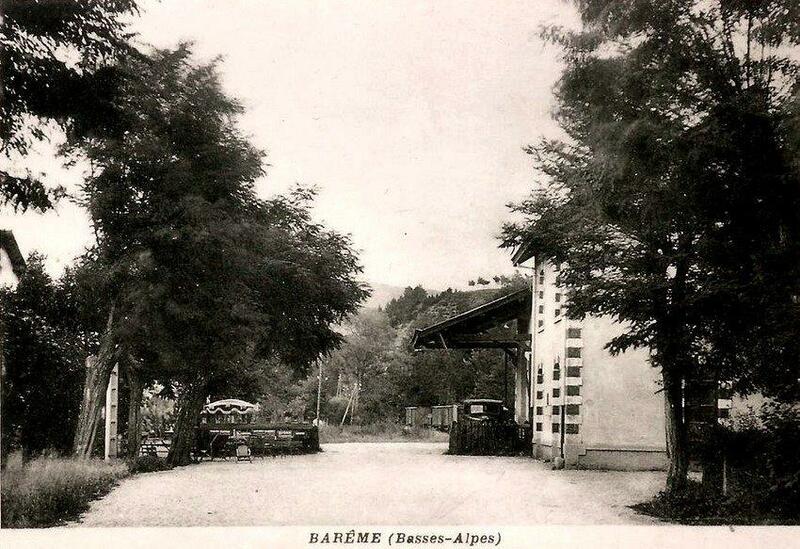 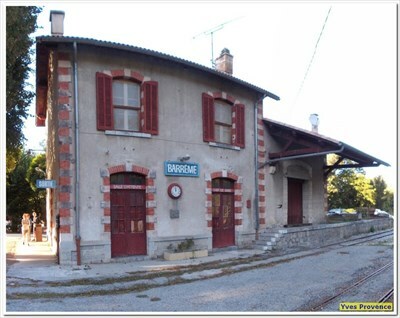 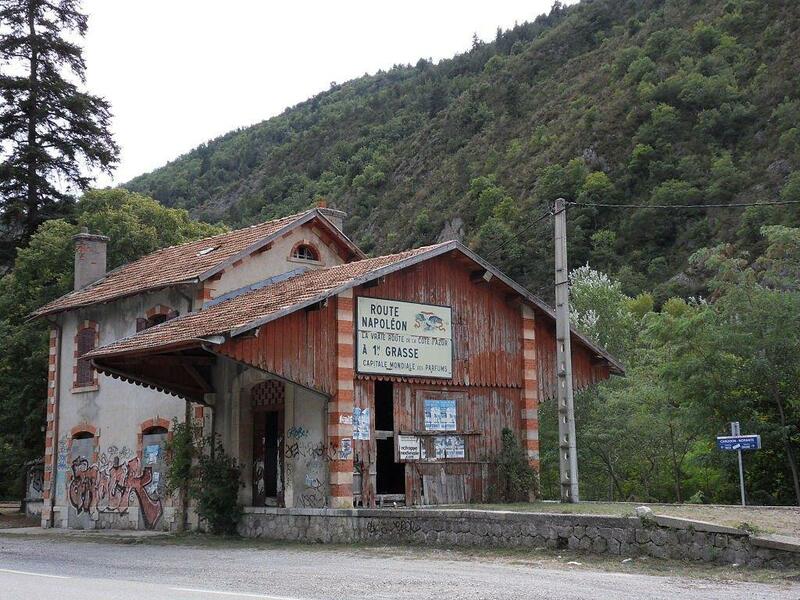 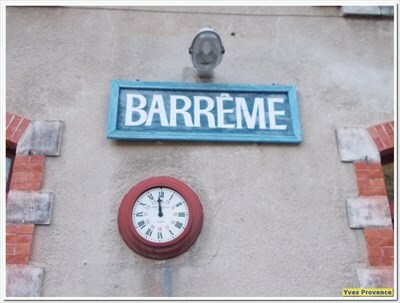 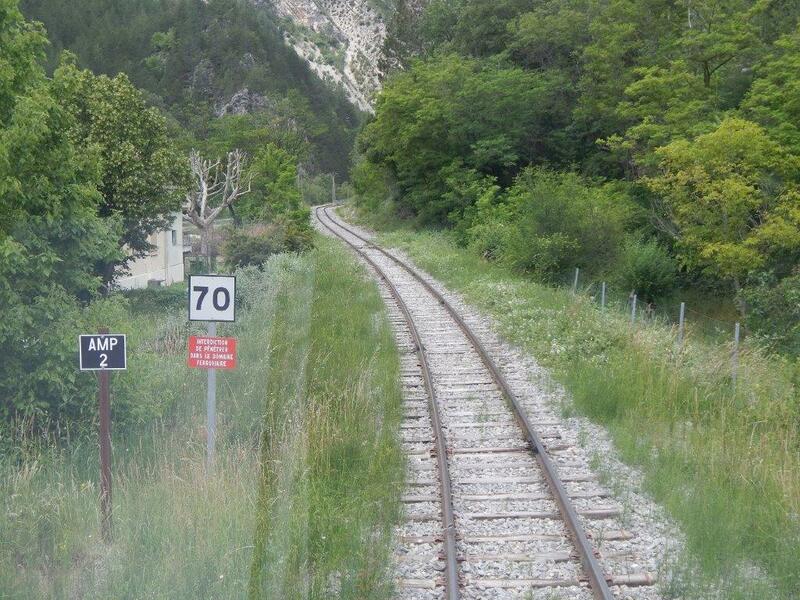 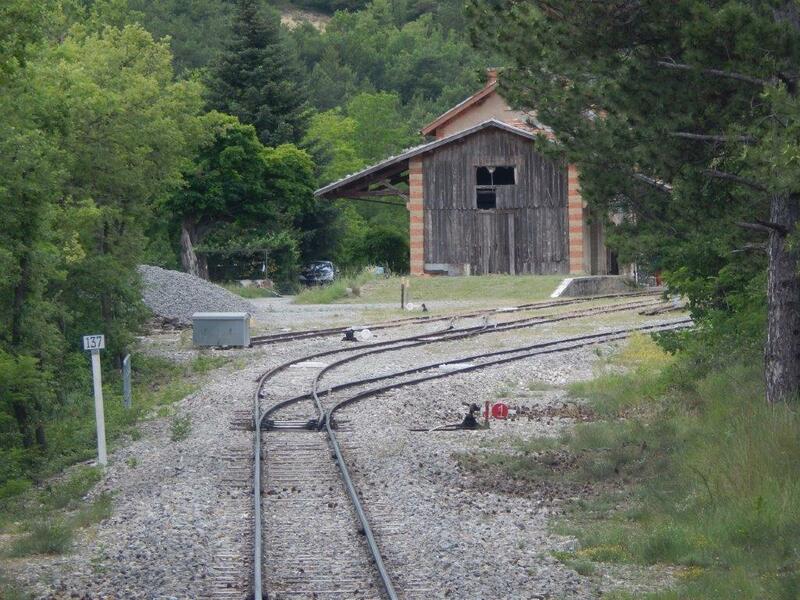 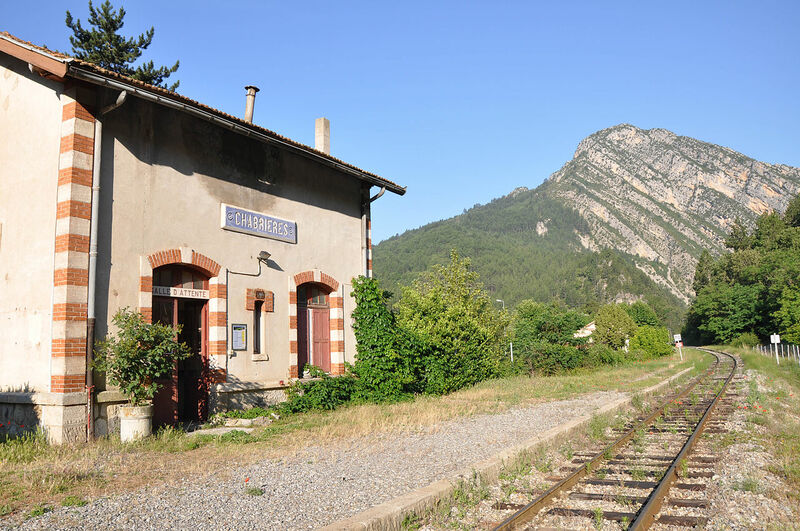 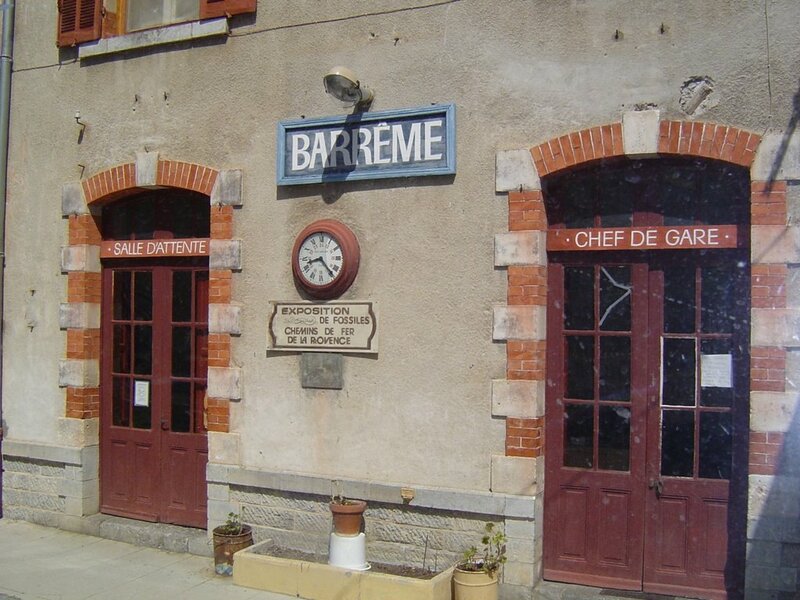 http://www.waymarking.com/waymarks/WMW8ER_La_gare_de_Barrme_Barrme_Paca_France, accessed on 17th August 2018.
http://trip-suggest.com/france/provence-alpes-cote-d-azur/barreme, accessed on 17th August 2018.
http://www.en-noir-et-blanc.com/barreme-p1-701.html, accessed on 17th August 2018.
https://mapio.net/s/43790270, accessed on 17th August 2018.
http://cccp.traindespignes.free.fr/gare-barreme.html, accessed on 17th August 2018.
http://www.passion-metrique.net/forums/viewtopic.php?f=2&t=4143&start=765, accessed on 17th August 2018.
http://www.verdon-info.net/2016/08/barreme-le-sequoia-le-plus-grand-de-paca.html, accessed on 17th August 2018.
https://mapio.net/a/57410889/?lang=nl, accessed on 17th August 2018.
https://www.delcampe.it/it/collections/item/373607900.html, accessed on 17th August 2018.
https://www.facebook.com/289910237832039/photos/a.289916164498113/1051891281633927/?type=3&theater, accessed on 17th August 2018.
https://dossiersinventaire.maregionsud.fr/gertrude-diffusion/dossier/gare-de-barreme/7ee076c7-a125-4622-b1a3-41f475e0f8ef/illustration/5, accessed on 17th August 2018.
https://dossiersinventaire.maregionsud.fr/gertrude-diffusion/dossier/gare-de-barreme/7ee076c7-a125-4622-b1a3-41f475e0f8ef, accessed on 17th August 2018.
http://dignois.fr/Barreme-vieux, accessed on 17th August 2018.
https://dossiersinventaire.maregionsud.fr/gertrude-diffusion/dossier/ponts-des-chemins-de-fer-de-provence/6db00f0d-4794-4fb9-8d66-a7675e5c748b, accessed on 17th August 2018.
http://www.rd-rail.fr/1-PHOTOS/PH43/index-ph43.html, accessed on 10th August 2018.
http://aubertrain.com/modules.html, accessed on 17th August 2018. 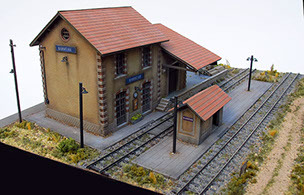 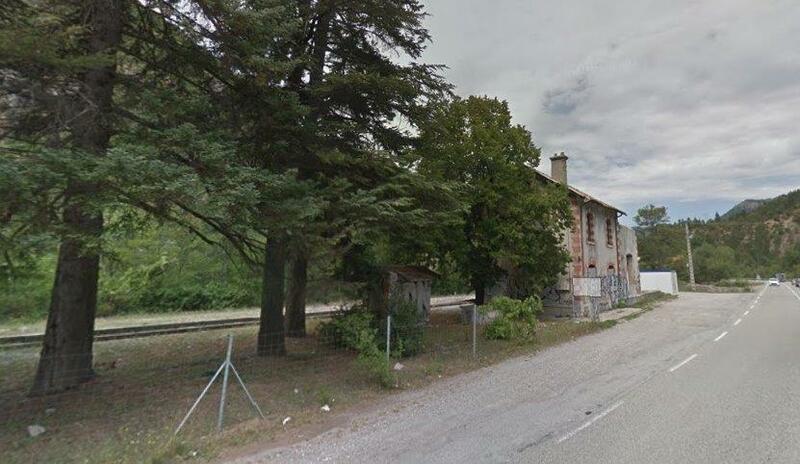 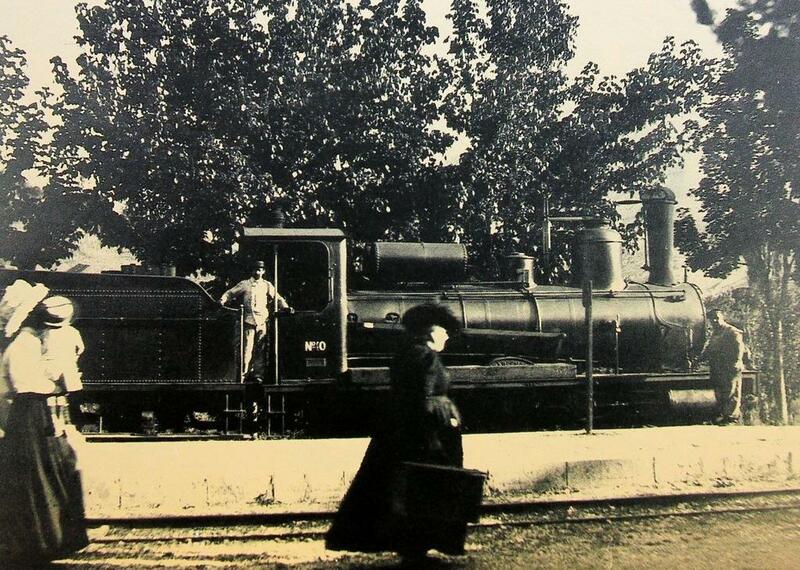 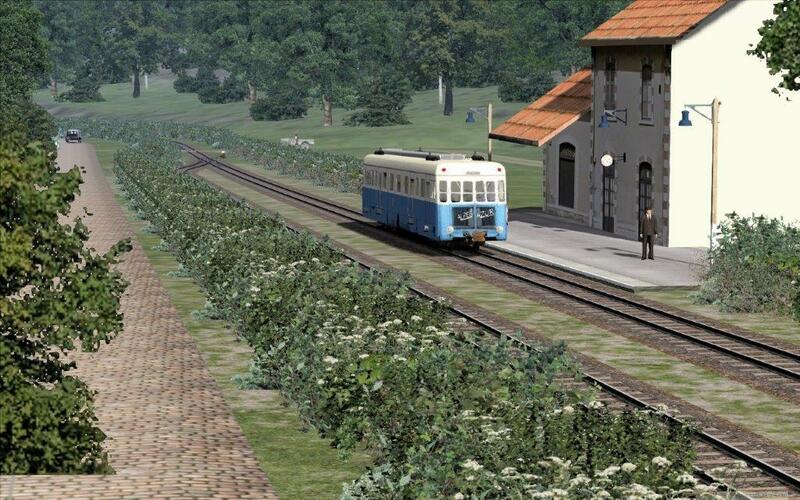 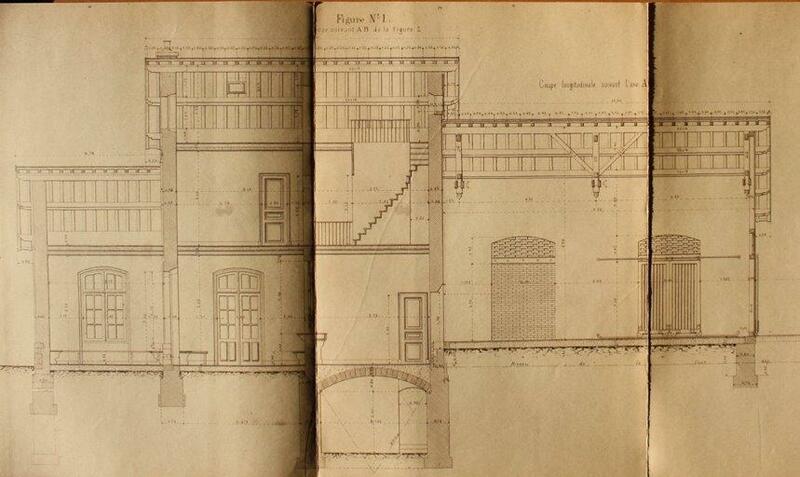 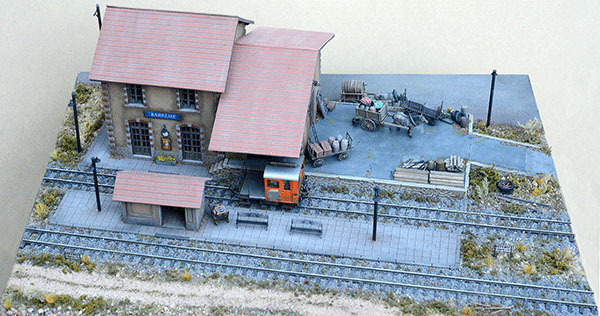 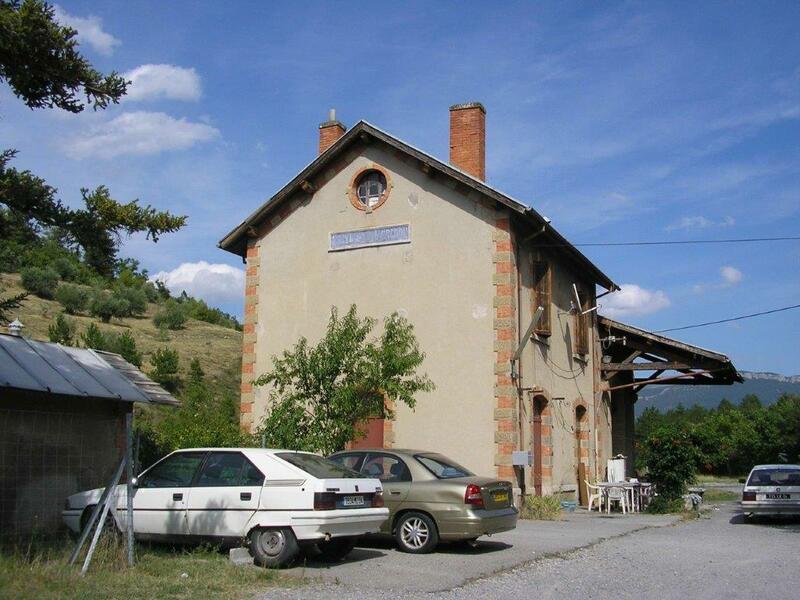 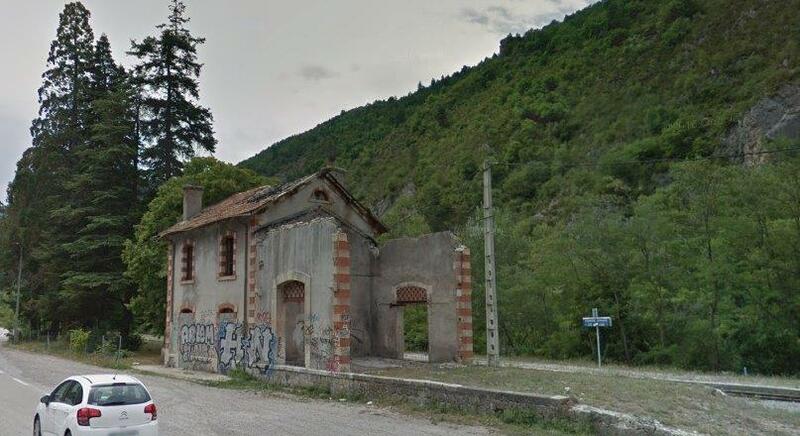 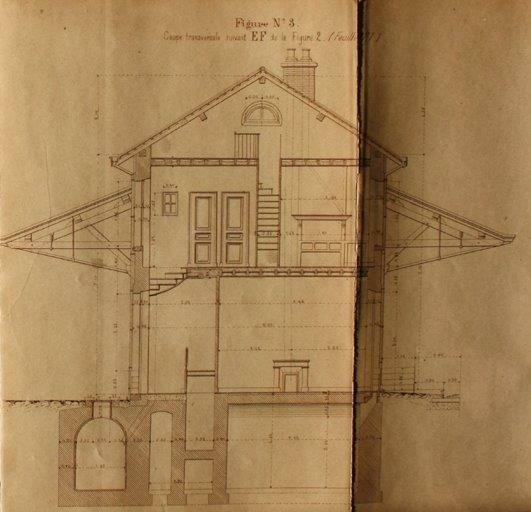 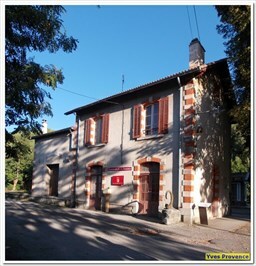 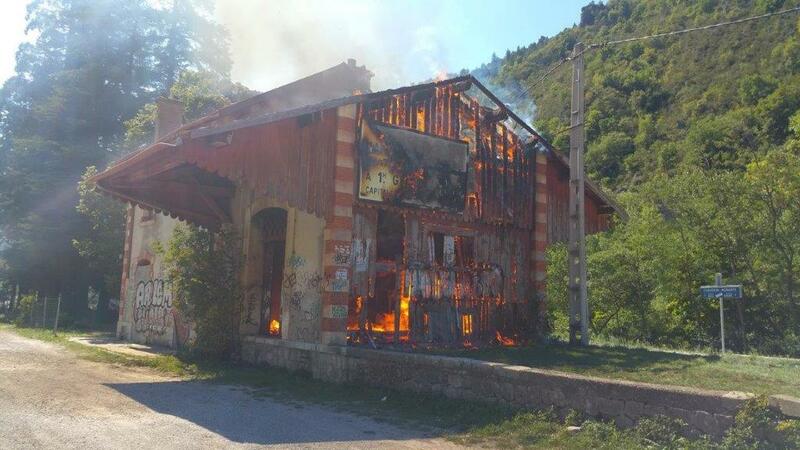 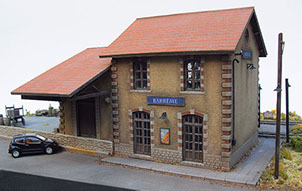 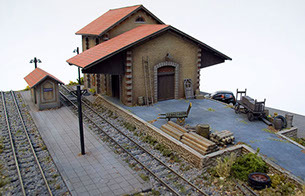 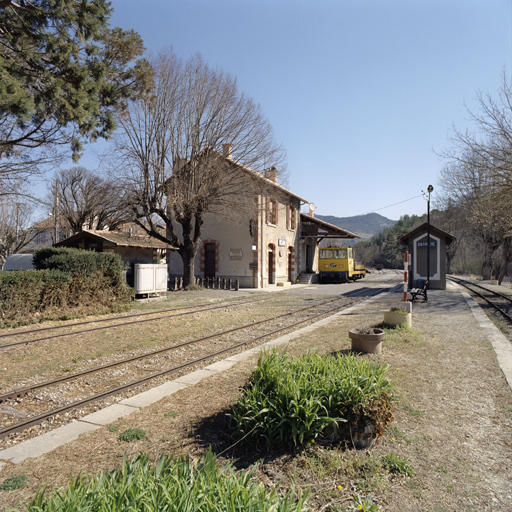 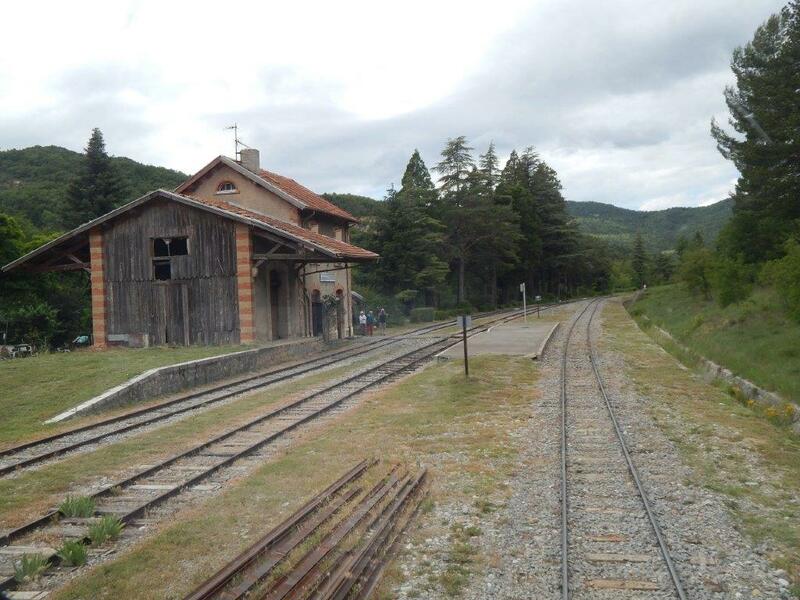 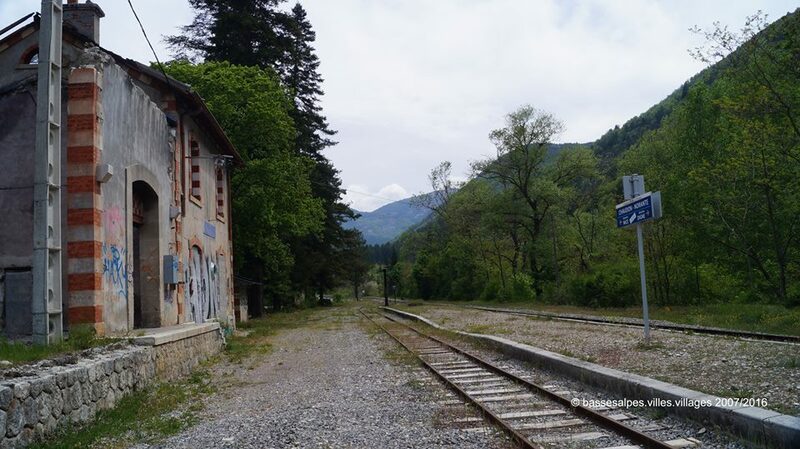 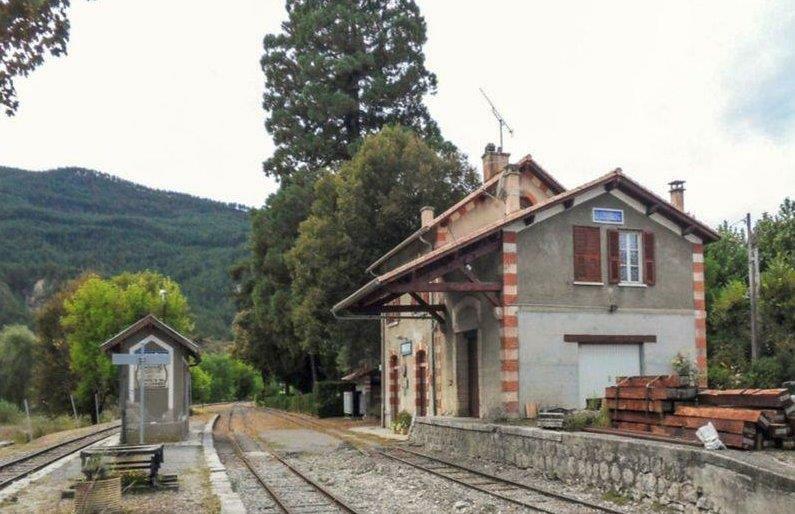 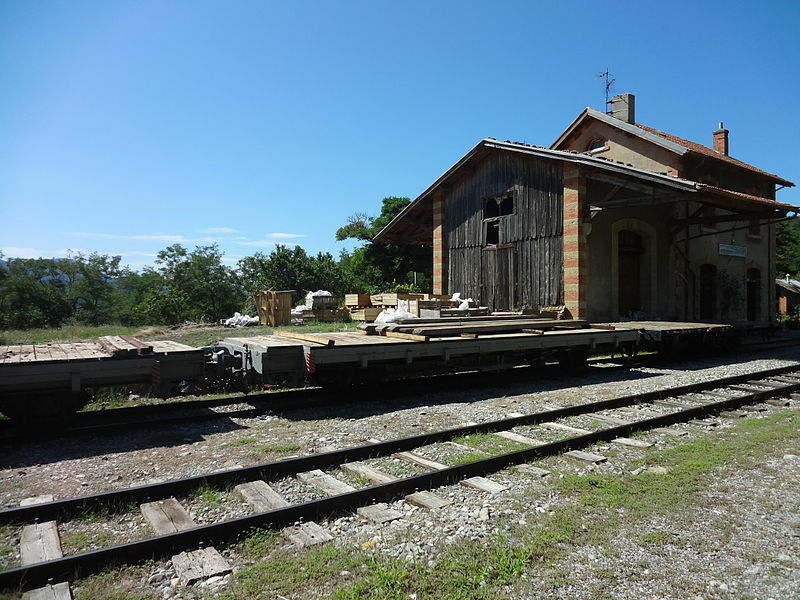 When the website was viewed in August 2018 the price of the completed model of the station buildings was 875 euros! 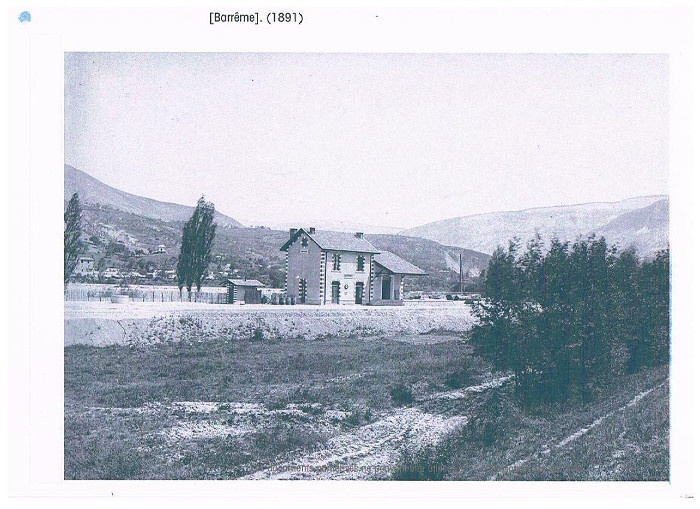 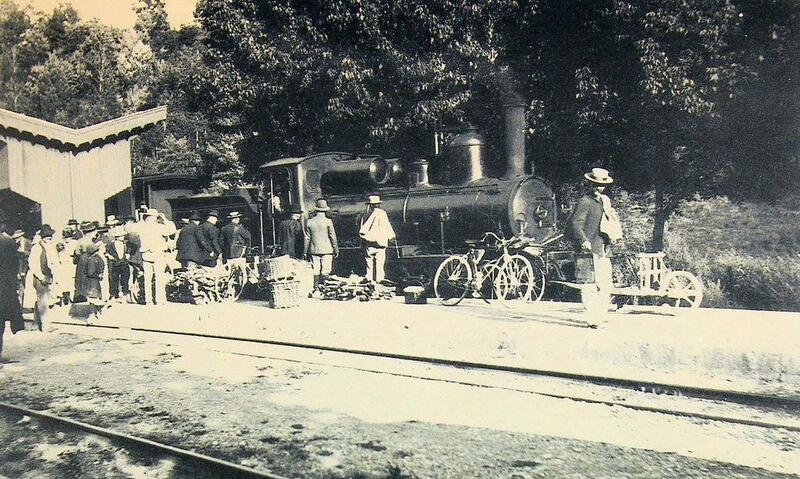 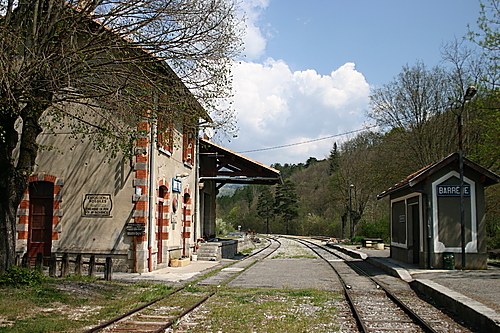 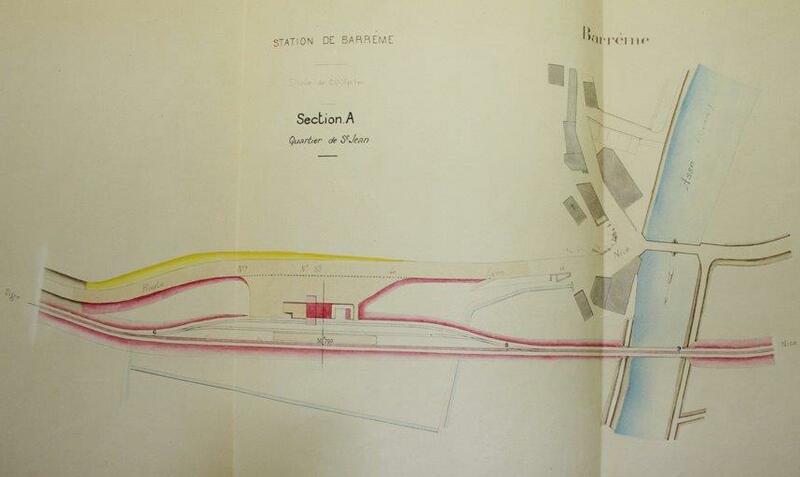 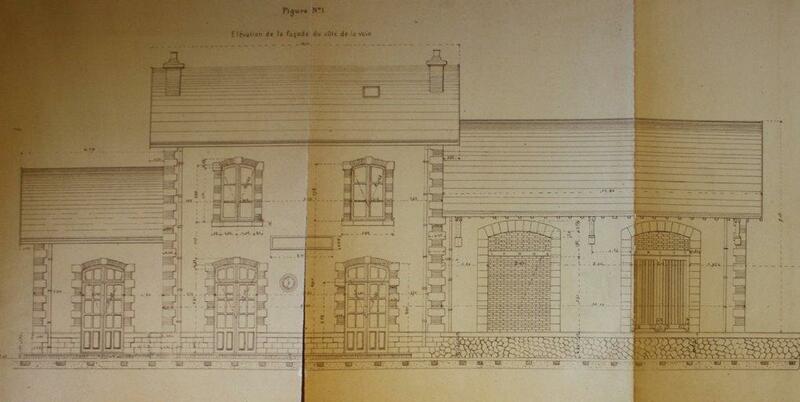 http://www.tunnels-ferroviaires.org/tu04/04055.2.pdf, accessed on 18th August 2018.
https://fr.wikipedia.org/wiki/Gare_de_Chaudon-Norante, accessed on 18th August 2018.
https://www.google.co.uk/url?sa=i&source=images&cd=&ved=2ahUKEwiFqcumuvbcAhVQhRoKHbBrBnkQjhx6BAgBEAM&url=https%3A%2F%2Fwww.pinterest.co.uk%2Fbluebird_492000%2Flocomotives-%25C3%25A0-vapeur%2F&psig=AOvVaw0HSlDauOM5V4uBMFKql98x&ust=1534676352265699, accessed on 18th August 2018.
https://www.facebook.com/photo.php?fbid=477991545741335&set=pcb.1058518700888525&type=3&theater, accessed on 18th August 2018.
http://www.tunnels-ferroviaires.org/tu04/04055.1.pdf, accessed on 18th August 2018.
https://dossiersinventaire.maregionsud.fr/gertrude-diffusion/recherche/globale?texte=couinier, accessed on 18th August 2018.
https://fr.wikipedia.org/wiki/Gare_de_Chabri%C3%A8res, accessed on 18th August 2018.
http://www.tunnels-ferroviaires.org/tu04/04074.1.pdf, accessed on 18th August 2018.
https://structurae.net/structures/clue-de-chabrieres-tunnel, accessed on 18th August 2018.
http://www.railsim-fr.com/forum/index.php?/topic/10163-le-train-des-pignes/&page=2, accessed on 20th August 2018. 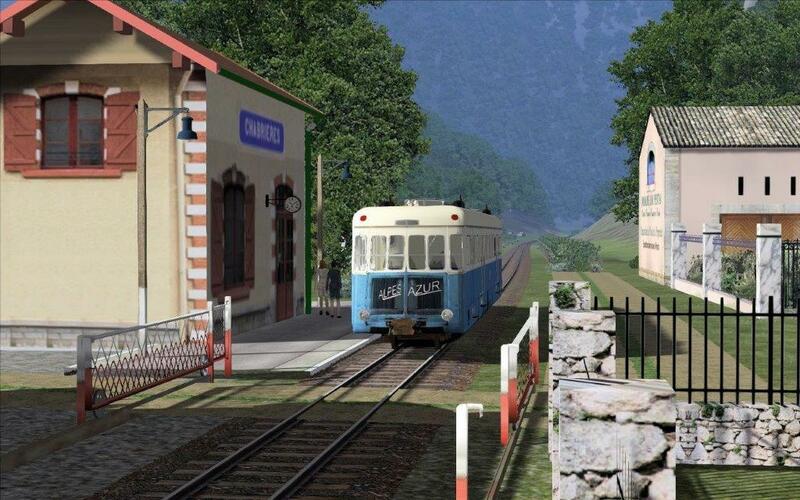 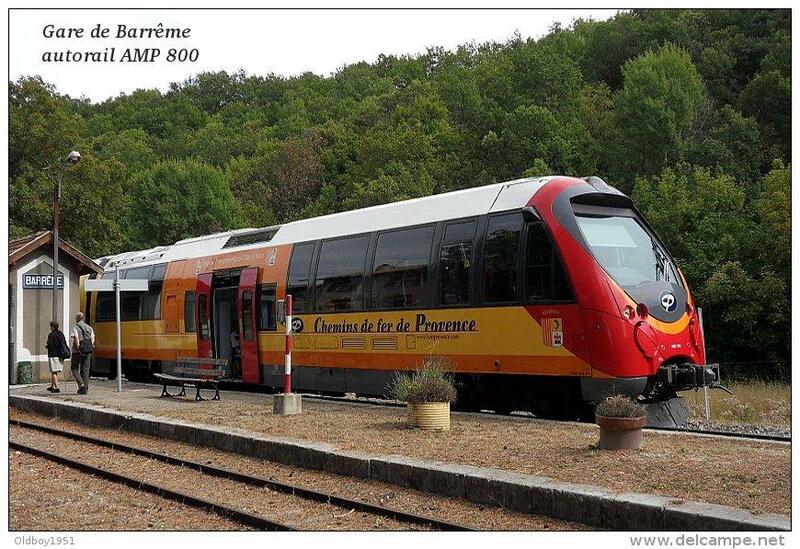 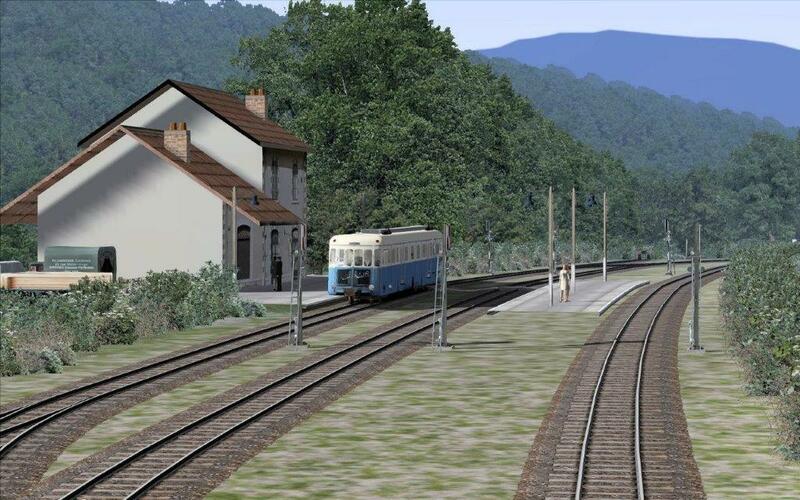 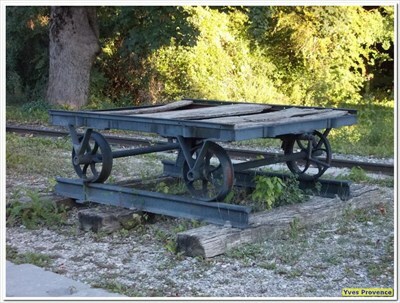 This entry was posted in Railways and Tramways Around Nice, Railways Blog on August 18, 2018 by rogerfarnworth.